Under the hood with Tekin’s Joe Bornhorst – Tekin – Smaller, Smarter, Faster! Today we go under the hood with Tekin facotry driver Joe Bornhorst. Joe hit the scene hard in 2013. Taking big wins at races like the Midwest Champs, making the A-mains at the 2013 ROAR 1/8 Electric Off-road Nationals, and most recently taking a podium at the 2013 Spektrum Race. At only 19 years of age he will surely be a racer to keep an eye on the next few years. Joe was picked up by Serpent USA and has already had great success with the cars. Let’s take a look “Under the Hood” of his Serpent Spyder Buggy SRX-2 RM buggy. Joe’s Tekin powered SRx-2 is setup in traditional rear motor configuration. Joe runs a flo yellow/white/red paint job which is easy to see on the track. Looking at his buggy it looks factory clean, tidy and ready for battle. The body off reveals a well thought out placement of equipment. Joe’s buggy is running the latest Tekin RSX esc(without the fan). Paired with the Tekin RSX esc is a Tekin Redline Gen2 7.5 motor. Joe runs a 2s shorty pack with the connectors to the rear. Note that his all white Tekin Flex Jacket wires are mismatched in length preventing him from plugging in the battery incorrectly, Factory! Next up is a close up of the new Tekin RSX esc. One piece cnc’d aluminum upper heatsink housing with diagonal cut fins. Seen in the picture is the Fan/Programming port for easy access and convenience.Notice Joe’s switch is mounted so the “on” is forward in case of impacts. This will help keep your car powered up in case of a forward “tap” with other objects. Next up is the power plant. Joe chooses to run a Redline Gen2 7.5T motor in his 2wd Serpent buggy. Notice the use of the included sensor harness clamp! Joe also again takes advantage of the Tekin Flex Jacket wire and routes it cleanly between the motor guard and motor plate, factory. If you’re ever at the races and you see this handsome face in the pits, be sure to stop by and say “hello.” Joe’s known for being very approachable and helpful in the pits. Even though he’s young he’s knowledgeable and willing to help you with your Tekin questions. “I’d like to thank Tekin, Serpent America, Desoto Racing, Magic hobbies, AKA, Double Crossed Designs, B-Fast, and PT RC racing oils.” Joe Bornhorst. 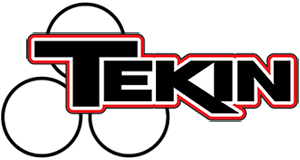 « Tekin take Round 1 of the Top Notch Series!